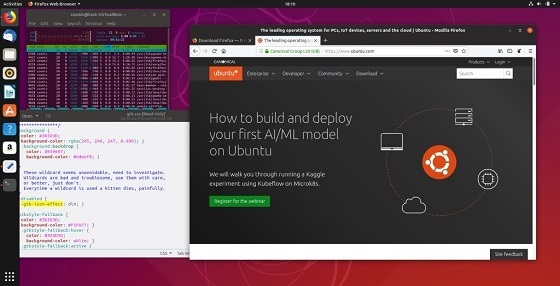 Canonical released a new version of the organization's Ubuntu GNU/Linux distribution; Ubuntu 18.10, called Cosmic Cuttlefish, comes with a new community desktop theme, improved snap desktop integration, multi-cloud computing optimizations and other improvements. Ubuntu 18.10 will be supported for nine months; organizations and users who require long term support should stay with Ubuntu 18.04 LTS instead which is supported for five years. 1. Select Software & Updates in the System Settings. 2. Switch to the Updates tab. 3. Set "For any new version" in the "Notify me of a new Ubuntu version" menu. 4. Use Alt-F2 to open a command box and type update-manager -c to open the Update Manager. ISO images for all *buntu flavors are also available. Check the top of the release notes for direct downloads. Users should check the list of known issues before they run the upgrade to the new version of Ubuntu. Ubuntu 18.10 includes the new GNOME desktop 3.30 which comes with new features and performance improvements. The new Ubuntu 18.10 makes better use of the GPU RAM cache to cache shell components in RAM to decrease overall system load and improve frames per second on devices running the new version of the Linux distribution. Users who make use of desktop zoom may notice that the operation performs a lot smoother. The smoothing of window previews takes the system's CPU and GPU utilization into account which should improve performance when the window preview feature is used in the operating system. The encryption software VeraCrypt is supported officially by GNOME Disks which means that it does not need to be installed separately anymore to mount and create encrypted volumes. ■ Option to manage Thunderbolt devices in Settings. ■ Option to automatically submit Error reports. ■ Snap support for XDG Portals. ■ Latest version of GS Connect packaged. ■ Upgrades to Linux kernel, OpenSSL 1.1.1 support, and Toolchain upgrades. ■ Improved gaming performance thanks to the new Linux kernel. ■ Yaru theme which replaces Ambiance and Radiance themes. ■ Images are available on all major public cloud spaces. ■ Ubuntu 18.10 Server includes support for Kubernetes version 1.12. ■ Linux app store grew to 4100 Snaps by 1700 developers. ■ Latest versions of Mozilla Firefox and LibreOffice are installed by default. ■ QEMU update to 2.12. ■ dpdk updated to 17.11. ■ s390x updated with a big list of improvements.